Product #1215 | SKU 300N | 0.0 (no ratings yet) Thanks for your rating! The 300N panoramic rotation unit allows the photographer to take sequential constant-angle shots around a single axis, an essential part of achieving accurate and easy-to-stitch panoramic compositions. The set positions of the 300N give ample choice of rotation angle and so of number of photos needed to complete a 360° pan and cover the most common requests of panoramic photographers depending on the camera/lens equipment used. To make angle selection easier, a ''click-stop'' selector screw is included and attached to a safety cable to prevent it from being separated from the head and getting lost. The 300N also comes complete with a secondary locking screw which stops unwanted or accidental rotation of the head when heavy or off-centre equipment makes it less balanced or when the head is used for non-horizontal rotation. The 300N can also be used as a turntable base for object panoramas, or as a means of reading the angle of rotation of camera pan movements in a range of photography. 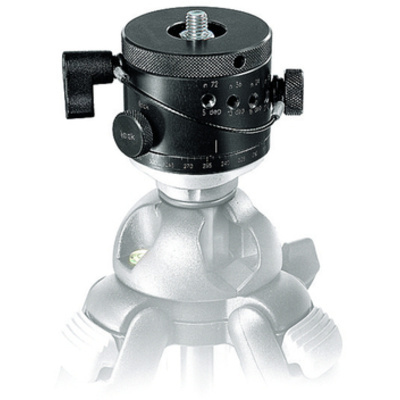 A camera can be mounted on the panoramic unit by adding one of a range of quick release, sliding or fixed plates or a conventional geared, ball or 3-way head. Note! 3/8"-16 male mounting screw on top and a 3/8"-16 female mount on the bottom.